What was your Favorit Creddie KISS in iSaved your life? iSaved Your Life oder iSpeed Date? Die Fanauswahl: iSaved Your Life! No contest! For the passed week i've been dating a guy named,James.He's so hot,smart,and hot,I could just stare at him all day. I was putting my math Bücher in my locker while Sam kept on talking about steak.Freddie came and seemed tense. "You alright,Freddie? "I asked consirned. "Yeah,I'm fine..."He said.He was lying to me,I know it! "Tell me the truth! "I demanded.The glocke rang for Weiter period. "I gotta get to class"He sagte while walking away.Sam seemed curious of why I was so consirned of Freddie. Freddie looked at me as if I was crazy. "What do we mean? We can't save her and it's out of our hands anyway," he said. "But we have to save her oder else Nevel might do something to her that will probably scar our lives forever!" I screamed. "Well we have to be frank about this. I mean, how are we suppposed to get to her anyway if she's probably somewhere hidden in his house," he said, and started to pace. "How about this?" I said. I went to go visit Carly the Weiter Tag after the fiasco that happened last night. I approached her door, and noticed that it was half open. _Who could have left this open?_ I thought to myself. I woke up dazed and tired. 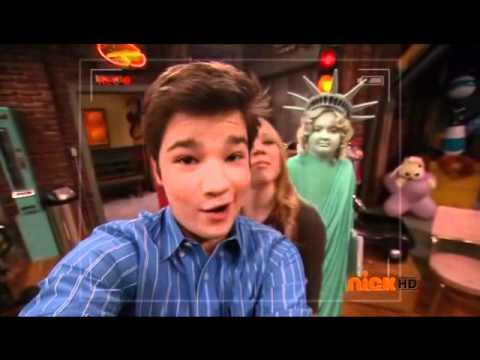 The last thing I remembered was that I was wrapped up in chains inside a box under Nevel's house and that I was beside Freddie's. My head hurt like crazy. I realized I was resting on my couch inside my and Spencer's apartment. Then I looked at the computer time and it sagte 3:00 A.M. I wondered how I got back home. Why would Nevel almost kill me and my Friends and put the whole school at risk? Do Du leave her in the middle of the night? I glanced over at Carly's cage and saw that she was fast asleep. I knew we needed to get out of here and fast. I started to struggle against the wire but it only held me faster. I looked around in where we were and saw we were in an underground cave that Nevel must've built somehow. Von every opening there was a guard and Sam had gone upstairs with Nevel. So all I had to do was wait 'till nightfall to escape. When we arrived to Nevel's house, we were transported underground. There I spotted thousands of computer screens, keyboards, and mouses. In front of me Sam still had that whiteness and blank stare i her eyes. Soon a figure stepped out of the shadows and stood beside Sam. "What are Du going to do with us now, Nevel? Kill us again?" I asked. Yes! I finally was going to prom with Carly! And this time I didn't have to ask her myself. I was so jumpy and jittery when I got Home to Bushwell apartments and went to my floor. I thought I heard something coming from Carly's apartment but then it stopped all of a sudden. So I guessed Carly dropped something on her floor and it spread everywhere. So I entered my apartment and shut the door. "Mom are Du home?" I asked again. Freddie just stared at me like he was going to pass out.All I did was mention to go to prom with me but I think he took it the wrong way. Although there was something I needed to mention to him also at prom.That's why I decided to ask him to prom. "Are Du serious, Carly?" Freddie said. "Yes, I am because if Nevel sees me with Du that'll mean that he knows that he never killed me and all of his plans to destroy iCarly will be ruined," I answered.